If I could encourage parents to do one thing, it would be to take a little time to make some real food snacks for their children’s lunch boxes. 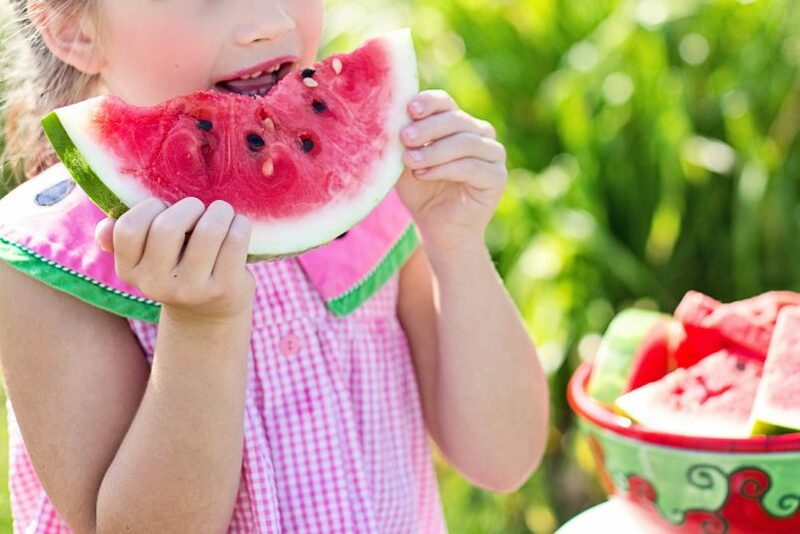 Less packet food and more whole food makes a huge difference to kid’s health. I would love you to add to the list, so please leave me comments and links! Because everything is more fun when you put it on a stick! Use paddle pop sticks for littlies to avoid accidents with pointy skewers! If your kids are really fussy, some fun shapes might be needed. It’s a wholegrain and surprisingly healthy! Just don’t buy the microwave packets – buy an organic popcorn and pop it in some coconut oil or use a popcorn machine. Jazz it up a bit with Herbamare, organic spice mixes or try my Salted Caramel Popcorn. Have fun with the kids making up your own combos of dried fruit, seeds, coconut and nuts (if allowed). Make them into Quirky Cooking’s Trail Mix Clusters. Just make sure the dried fruit you are eating is safe. Soooo cool! Use a little lemon juice to stop the apple from browning, sandwich together for ease of transport and use seed butters or homemade nutella if your school is no-nuts! Inspired by Justina Blakeney. Homemade custard with a healthy sugar and organic ingredients is so much better for your kids than the supermarket variety! Try this dairy-free Strawberry Coconut Custard recipe from Iwa at Additive Free Bites. Yum! A powerhouse of nutrition in a single bite (or two)! Check out my Amazeballs! 10 Amazing Bliss Balls post for recipe inpsiration. The Apricot Muesli Balls are pretty good too! 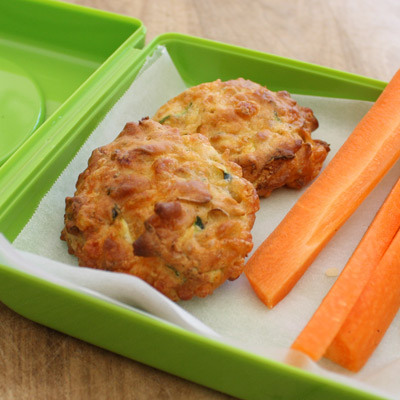 A totally brilliant recipe from Vegie Smugglers for the kids who like savoury stuff. Add in a heap of vegetables and some Vital Veggie Power and the kids are eating super healthy! Be wary of store-bought crackers. They are a minefield of canola oil, additives (including msg) and refined salt. We love the easy seed crackers recipe – easy to make and nut free! HOT TIP: If your school has a nut-free policy, try substituting seeds for nuts in recipes. Sunflower seeds make great ‘butter’ and flour! Who doesn’t love a muffin? Make sure they are homemade though, to avoid all the nasties! I have 10 Healthy Muffin recipes for you on the blog to get you started. Again, homemade is best – make a big batch, add some fresh fruit puree and pop it into reusable containers or squeeze pouches. If you are dairy-free, it’s easy to make your own coconut yoghurt at home! One of the best inventions ever! 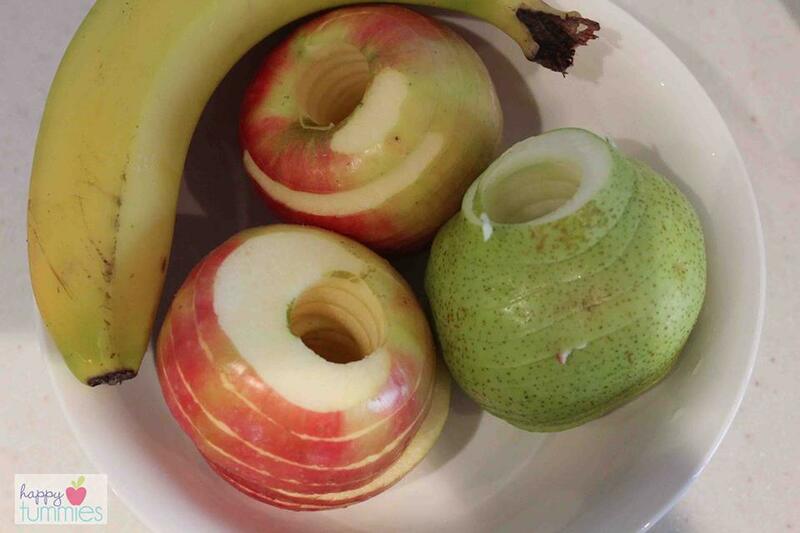 Why fruit is more appealing in a slinky shape, I have no clue. But, hey, whatever works. Lisa from Happy Tummies says she keeps the core in and skin on and they don’t go brown. So incredibly tasty, healthy and popular with kids. I have heaps of banana bread recipes for some inspiration. 13. Vege Sticks and Dip. Kids like a dip! Choose the veges your kids will eat or cut them into shapes if you need too. Baby qukes, snowpeas and cherry tomatoes are all sweet and tasty. Add a healthy, homemade dip and away you go. You could try my Easy Green Dip or the Wholefood Mama’s Carrot Hommus. For easy transport, pop the dip in the bottom of a small jar and fill with veges! So, a scroll is basically a scone dough, rolled out into a rectangle shape, sprinkled with toppings, rolled up, sliced and baked in a hot oven. Adapt the flours and ingredients to suit your needs! Make them savoury with veges, tomato paste and cheese or sweet with homemade nutella or fruits. Try these Pumpkin Cheesymite Scrolls from Lisa at Happy Tummies. Making your own muesli bars at home is so economical and tasty! Try my Blueberry Breakfast Slice, Easy Muesli Bars, Date and Oat Bars or my Gluten Free, Nut Free Muesli Bars. They are all the rage and they are incredibly nutritious. Find out how to make them at my Kale Chips… what’s the go? post. My Sweet Potato Chips are also pretty good cold if the kids won’t come at anything green. Yum. Try these Blueberry Buckwheat Pikelets from the always delicious Veggie Mama. They are gluten-free! Or if you know how to market it right, the green pancakes are also fantastic! Great for kids who struggle to eat lunch. Pop a smoothie in a small jar or thermos and your kids get a whole lot of nutrients in a drink! Make a green smoothie or try my Choc Banana Protein Smoothie. A tasty little morsel for kids – the real food version of thehealth food aisle packet snack! It’s a quick, no bake snack you can make in a hurry. Apricot coconut slice is a winner in our house! HOT TIP! Save yourself a heap of time and energy by making double or triple batches of healthy snacks and freezing them. Pop them in the lunch boxes straight from the freezer. Let them eat cake. Seriously. But don’t buy it, make it with whole foods. Just soak a packet of organic chickpeas overnight. Rinse well, add some coconut oil or macadamia oil and your choice of seasoning. Roast in a moderate oven for about an hour or until really crispy. Very yummy! There is such a thing as a healthy biscuit! Try my Coconut Biccies or the 2 Ingredient Biscuits for inspiration. Granola is simply muesli that you whack in the oven with a little honey or maple syrup until it’s nice and crunchy. 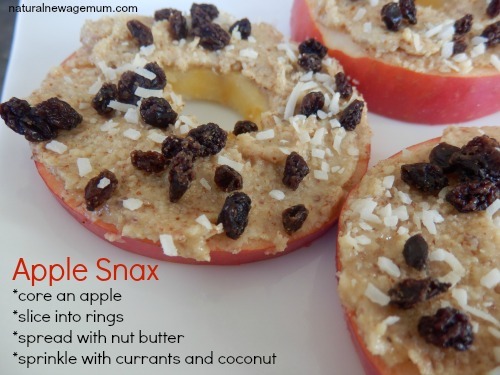 You can make it with all sorts of yummy things and it makes a great little snack. A perfect snack for little hands! If you want, you can make them into fancy shapes with bento tools or just a wooden spoon! Get medjool (fresh) dates or dried dates, spread with nut or seed butter or homemade nutella and then roll in coconut. Wedge a few almonds into a date and it will look like a cute turtle! A super healthy snack – cheesey, dehydrated, raw cauliflower pieces from Sarah at The Raw Food Mum. Get the recipe here. A brilliant recipe from Jane at Marinya Cottage Kitchen. Part cracker, part biscuit, all yum. They are free from grain, gluten, egg, dairy, nuts and refined sugar! Win. 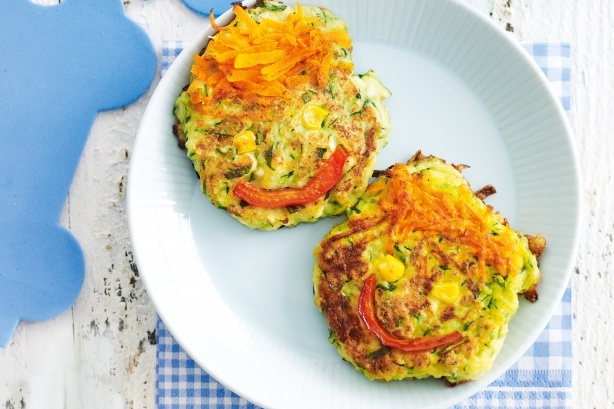 I’ve seen many vege-hating kids happily hoover up a vege fritter! Make them according to your tastes – they are easy to make gluten and dairy free. I love the fun face presentation of these ones at Taste. Just press on your veges to make cute faces before you flip them. If you have a thermomix, Taryn shows you how simple and quick they are to make with her Very Veggie Fritters recipe. These taste like lollies! Sooo good! Just pop a little fruit juice or coconut oil onto banana slices and bake in a low oven or dehydrator until dried out. Store in an air-tight container. Sometimes you just need a packet snack when time is short or the kids want a treat. There are some great crap-free superfood bars on the market now – have a read of the ingredients first though! I don’t need to look anywhere else now! Thankyou soooo much!!!! There are soooo many great ideas here. I will definately have inspiration now for a healthy lunch box. Thank you so much for this list. I needed some nut free inspiration for starting school and I am sure my daughter will eat most of them. Love your work!! Absolutely brilliant list Sonia. There is something there for every taste. Will be using lots of these ideas next week! Love it Sonia!!!! Some great ideas I am soooo going to try out! It seems to be the ones people want.. and nut free too! Anyone know where I can buy pop sticks for the fruit kebabs? Have only seen them in craft stores so I don’t think they’d be food safe? Haven’t looked for them at supermarket but maybe they’d be with icecream cones?? You could try hospitality wholesalers or packing wholesalers? Thanks! I really needed this list! Hi Cara, thanks for dropping by – hope it helps! thanks so much for the new and healthy ideas. Its so easy to throw a bought or pre packaged product into the lunch box, but its really just as easy to make or choose correctly with your information. Fantastic, keep us posted. Having all these recipes in one place certainly makes life easier! Thanks Sonia. It is a great way for kids to eat veges! Love it! Thank you for this. Great post. Will be busy in the kitchen the next couple of weeks, filling up the freezer with goodies! Thank you Sonia, my kids won’t get bored with this list! Some really super ideas right there!! Looking forward to giving some of it a go.. I’ve never been big on pre packages foods so this will really help me. Thanks for having me, beautiful! Wow that’s the best snack list ever. Now with a kindy kid as well as school kid, I will be needing this 🙂 Thank you Sonia. There is so much variety I will seriously never be stuck for ideas. You are so welcome Kate. your link to the Notella (no nut Nutella) has hazlenuts in it. Thank you so much for such a great list of ideas. I will definitely be trying these ideas. Do you think I would need to pack an ice pack if I put bliss balls into my kids lunchbox?